Landscape architects are increasingly called upon to address the challenges of changing economic, demographic, and environmental conditions, all of which have a significant effect on the character and distribution of public health problems. One need look no further than this blog or ASLA’s guide to the health benefits of nature to grasp how the potential for using nature to improve our health excites both designers and academics alike. A recent article in The Dirt, What Dose of Nature Do We Need to Feel Better?, covered new research on the health benefits of nature and spurs me to write a comment about how we measure anyone’s responses to a “dose” of nature. I work in public health research and focus on the contribution of biophilic design to human health and well-being. Biophilia is a term elevated by famed evolutionary biologist E.O. Wilson. 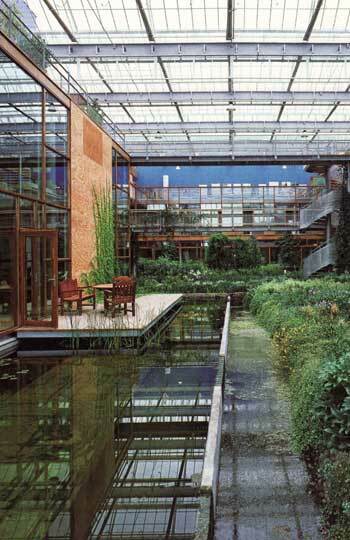 He defined it as an innate emotional attachment to and affinity for nature, and the design community has transformed that insight into an approach called biophilic design. In both indoor and outdoor environments, biophilic design is thought to support health and well-being through the use of natural features, materials, and settings that tap into deep-seated evolutionary preferences. Through my work, I field questions from essentially three descending geological strata: The “leaf litter,” if you will, are the questions characterized by idle curiosity, such as: “I know intuitively that I feel better in natural environments, but what can research tell me about why?” The next layer of questions graduates to more granular humus and minerals: “What types of landscapes and specific design features support the range of outcomes (productivity, health, and well-being) that I see cited in the popular press?” But the bedrock questions relate to mechanisms (what constellation of design features work, for whom, and under what circumstances) and metrics of assessment (which biomarkers over what interval credibly link landscape exposure to desirable behavioral, psychological, and physiological responses?). These are the methods used to assess any other public health intervention at a population scale and, increasingly, they are applied to natural or “green” environments as well. Careful readers ask questions of anything upheld as evidence-based or “true.” Most studies relating to the health benefits of nature don’t provide enough detail about landscape features and participants to delve too far beyond the leaf litter. Often, it’s as if the participants arrive in a green space as a blank slate, without the etchings of a lifetime of learning or even the residual dustings of the morning’s events. Large, statistically-significant populations can help us rise above individual differences in dose-response studies, but we are still missing many critical insights that might, in the future, allow us to tailor recommendations for healthy environments to individuals. Popular interest in the use of biophilic design to bring nature, and natural design cues, into the built environment also introduces interesting bedrock questions about the affect of indoor priming on our responses to outdoor environments. Priming happens when we are exposed to a stimulus and that initial exposure colors our responses to subsequent stimuli. The effect of indoor environments on priming restoration isn’t well understood. By way of example, a 2010 meta-analysis produced by Jo Barton and Jules Pretty looked at the benefits of exercise in green settings. They found that participants in research studies derived notable benefits from a relatively short period of exercise in nature, with diminishing but positive returns thereafter. Put another way, short exposures to green spaces — perhaps as small as 40 seconds, as detailed in a recent study of viewing green roofs from Australia — capitalize on the shift between where you’ve just come from and where you are. Our bodies and psyches adjust to exposure, just as they should, although the benefits continue to accrue after (what is essentially) neurobiological acclimatization. Visions of healthier, more sustainable futures often include the use of biophilic design to bring the outside inside, softening the upwards of 90 percent of time we spend indoors. How then will our neurobiological resting states – and the conditions that provoke short-term restoration – shift? Is the research participant who steps out of a biophilic building effectively primed differently than the one who steps out of a more conventional office setting? If so, should the structure of nearby restorative landscapes change in response to the levels of biophilic design found in abutting buildings in order to reliably produce a restorative response? It’s unclear if the future of health research even holds space for questions which are, effectively, not essential to human survival. If we allow ourselves the luxury to consider optimizing landscape design for human health and well-being, however, I believe we should pay more attention to the transitional spaces and mind states that often set the tenor of experience: the doorway, the window, the moment at which a vista assembles itself into an intelligible and pleasing frame. Where we come from matters and, if we’re thoughtful about where we’ve just been, it will also change where we’re about to go. This guest post is by Julia Kane Africa, program leader, Center for Health and the Global Environment at the Harvard T.H. Chan School of Public Health.